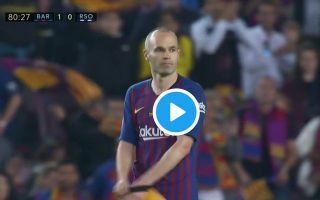 Andres Iniesta made his final appearance for Barcelona on Sunday, and it was unsurprisingly an emotional and memorable night for the Catalan giants and their club legend. There was a perfect parting gift for the 34-year-old as Barca celebrated winning the La Liga title alongside his farewell, and having made 674 appearances for the senior side, that was his ninth league title, along with four Champions League trophies, three FIFA Club World Cups and many others. In turn, there is no denying that Iniesta has written his name into club folklore, and his legacy will certainly live on having had such a positive and influential impact on the club during his time at the Nou Camp. No official announcement has been made over his next move and so his focus will likely be on the World Cup next month first before he makes that decision. However, it was certainly an emotional night for him on Sunday, as seen in the videos below, as he was treated to the bumps from his teammates, a chorus of his name being chanted by over 80,000 fans inside the stadium and an incredible choreography from the home faithful as they sent a clear message to him to thank him for his contribution. In a mark of the class of the man, he was later seen giving out jerseys to supporters well after the full-time whistle, as seen in the video below, giving these lucky fans a chance to claim a bit of history and know that not only were they present for his last game, but they got a very valuable memento from the day too.